If your booking is cancelled less than 2 weeks prior to arrival, 60% of the total booking fee will be charged. Stoked Backpackers’ three-storey building has spacious rooms – all en-suite! – and offers a variety of shared dorm accommodation, as well as some private family/friends rooms. Crisp, fresh percale linen, thick spring mattresses and comfy duvets await you. Bathroom towels are supplied with private rooms and can be rented for the dorms. To save you from the wrapped-in-towel hallway dash, almost all the rooms have an en-suite bathrooms. There is free unlimited wifi, not only in the communal areas, but in all the rooms too. We also have digital safes in the private rooms and lockers in the dorms. Very clean and spacious with a lovely ocean view! The staff is very nicee and the location is perfect ! I had so much fun staying here! It’s not in the safest area, but just use common sense and street smarts and you’ll be fine. It has such a solid view of the beach and is close to just about everything. If you stay here make sure to have Henry take you on a Township Tour! They booked all my excursions for me (white shark diving and a safari) which made everything super easy. Nice, quiet hostel. Rooms are relatively clean. Served as a nice base for a few days while we explored the area and did water activities. 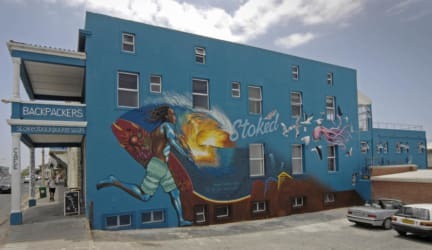 Location is great if you are surfing - 5 mins walk to the surf schools on Muizenberg beach and 20 mins dive to Simons Town for other activities. It's worth having your own transport if you stay here and plan to explore beyond Muizenberg. One of the better ten bed dorms I have stayed in. Location is as good as it gets. Clean, kitchen small but enough. Veggie cafe is nice surprise. When charging the rates that they do they should at least fix things-the door handle to the dorm was broken, both bathroom windows had no handle so couldn't be properly closed, towel rail was missing and no hooks to hang your towel etc. Terrible wifi. No lockers in the 7 bed dorm. The 5 bed dorm has an attached private, so it's not really a 5 bed and is right on the main road so bring earplugs. No signs advising people to save water (lots of people are new to Cape Town and wouldn't realise.